Join the buzz this Wednesday Feb. 12 on Twitter for #Landscapechat. This week’s topic is Honey, Bee Mine and is all about honey bees, the important pollinators. Learn why the honey bees are disappearing and how this is affecting both food supplies and the environment. Live Q&A on #Landscapechat will provide a summary of the problem as well as sweet insights on how the backyard beekeeper and gardener can become part of the solution. Experts will wax eloquent on plans to combat this crisis such as the Rodale Institute’s Honeybee Conservancy. Join @CoronaTools and #landscapechat co-partner, Aaron Kinsman, media relations specialist @RodaleInstitute for this week's topic Honey, Bee Mine. The live chat begins February 12, 2014 at 11 a.m. PST / 2 p.m. EST, were we come together with green industry experts and fellow landscape tweeps each week to discuss all things related to landscape, since 2011. 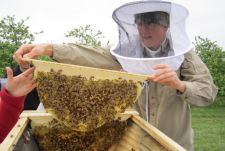 Instructor Meme Thomas displays a healthy hive during Rodale Institute’s Honeybee Conservancy class. Don’t miss out on this exciting topic as we welcome the Rodale Institute's Honeybee Conservancy to the #landscapechat community! Just sign into #landscapechat Nurph with your Twitter ID and you can follow the conversation and share with the community. It will automatically add the hastag to all your tweets too. If you do miss the chat, you can still access the complete replay on Nurph or on our Storify transcript; both are available 24/7 following the live chat. and include all the information and links shared during the discussion. Come join us on this sweet topic to learn more and chat live on #Landscapechat!